Defending champion Michael Hoey has missed the third-round cut at the Dunhill Links Championship after his round of 72 left him on two under. Hoey hit five birdies at St Andrews on Saturday but three bogeys and a double bogey left him at least two shots outside the likely cut mark. Darren Clarke is also on his way home despite an improved 68 at St Andrews which left him on three under. Gareth Maybin finished on one under despite a 69 at Kingsbarns. Clarke didn't drop a shot in his 68 but it was still two shots too many. Maybin was also bogeyless in his round on Saturday but the damage had been done by his two opening rounds of 73. South African Branden Grace is four shots clear of the field on 20 under after a 69 at Carnoustie. Shane Lowry remains as the best placed Irish player on seven under after a 71 at Carnoustie with Padraig Harrington on six under after a 66 at St Andrews. 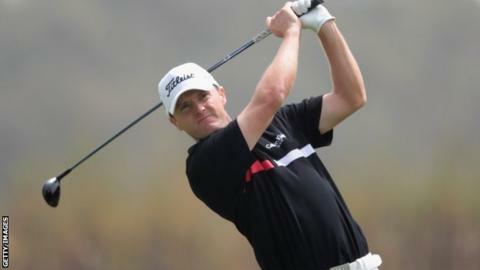 Peter Lawrie is also six under after a 68 with Damien McGrane missing out on three under after a 74. Simon Thornton ended on level par after a 73 at Kingsbarns while Paul McGinley's 73 left him on one over.